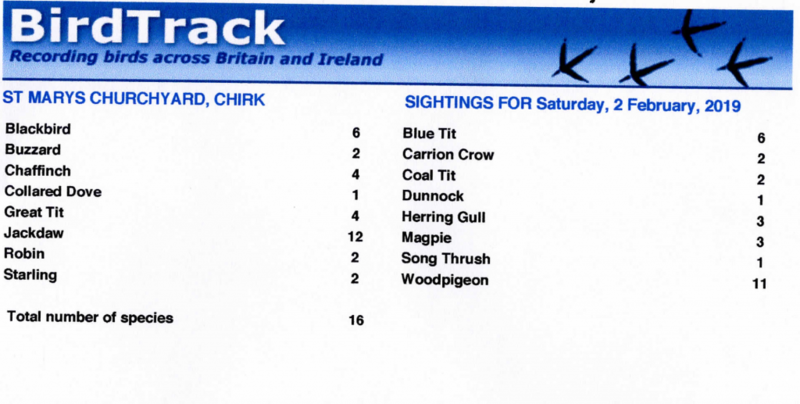 Here is the Bird survey for February done by Kit Twigg (see below). Other things to look out for this February, are the beautiful snow drops, yellow aconites, a huge covering of purple crocus and some purple hellebores which are just appearing. The Prunus (cherry tree) is in full pink bloom at present. We have moved a bench nearer the magnolia tree (East wall of the church) Hopefully it will allow the visitors to those graves to spend more time in this lovely area. We are making Bee/wasp holes/houses in large pieces logs at present. We will place these near the ivy (Hedera helix) that they love. The ivy is valued for providing wildlife with food and shelter particularly in the winter when food is scarce. We have placed 2 shallow water containers in the churchyard for insects/birds to use during the year.